Fendi calls this the Kan I, which honestly isn’t the easiest bag to describe. For starters, it isn’t just one bag, it’s many different bags that come in enough permutations guaranteed to make your head dizzy. Let me explain. At its core, the Kan I is Fendi’s new boxy shoulder sling that comes in at least 2 or 3 sizes anchored by square pyramid clasps. Then there are the many styles, which range from the really basic (think straightforward full leather slings that come with the most minimal of embellishments) to the full-on Marie Antoinette (think scalloped edging, contrast embroidery and 3D appliqués in every pastel colour imaginable, for starters), making it a bag (or in this case, a selection of bags) that will truly appeal to anyone and everyone. Made up of dual gusseted compartments separated by a stiff partition, the other thing to love about the Kan I are the slings it comes with, and depending on the one you pick, it might come with a long metal chain sling, or short leather top handles topped with, you guessed it, even more embellishments. In other words, whether you believe in #lessismore or #moreismore, there will definitely be a style just for you. 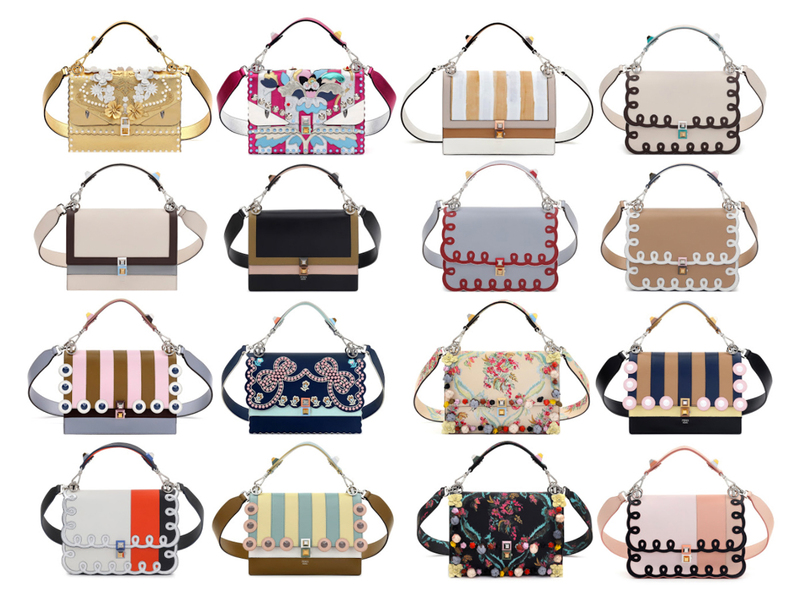 And if the slings/straps that come with aren’t enough, just pick up more slings from Fendi’s Strap You collection (add in a fur charm or two) and make your bag a true one-of-a-kind creation, where it is only limited by your imagination. You ask ‘Kan I?’ I say, why not? Check out all the pieces (prices range from SGD2350 to SGD8250) at Fendi boutiques in Marina Bay Sands and Ngee Ann City now. Been wanting to own a signature leather backpack without compromising style and comfort? Well well, why not take a closer look at Gucci’s Soho Leather Backpack? A stunning backpack creation, this leather backpack belongs to Gucci Soho Collection. One can easily spot a Soho creation for its embossed GG logo placed on the center. The Gucci Soho Leather Disco Bag is its most precious and prized item from the collection but the backpack version is continuously running along in the competition. The Gucci Soho Leather Backpack is minimal in design yet heavy on materials. It is made from resistant, textured leather thus protecting your belongings from getting soaked from the rain. It also features a backpack chain straps and a top handle for easy carrying. It has a front zip pocket which is quite accessible if you feel like reaching for your tissue or other essentials. It also comes in two styles that you can choose from: Hibiscus red/blue leather and Black leather and measures 9′ x 12′ x 4.75′ inches (W x H x D) inches and is priced $1690 USD. Givenchy Faux Leather Bag? If Only That Was The Only Problem With This Antigona Replica! About a year ago I wrote a piece on designer bags made of artificial leather that was inspired by a Givenchy faux leather bag. The iconic Antigona bag, to be more precise. Back then I was talking about the real Givenchy Antigona Medium but today I’m going to talk about a Antigona Givenchy replica that is obviously not made of real leather either. Givenchy Faux Leather Bag – Is It Worth It? My only problem with the authentic Givenchy faux leather bag was its ridiculous price. To me it just didn’t make any sense to spend 2k dollars on rubberised PVC. While I completely understood the ethical reasons behind this, I couldn’t understand why they would ask so much for it. I get people who would wear it to stay true to their values, but shouldn’t it be less expensive? A reader sent me some photos of her new Antigona Givenchy replica and I have to tell you, there are big differences in quality when it comes to replica bags. It is extremely obvious that this Antigona bag is not made of real leather but that’s not the only reason why it looks so cheap. You can find a guide on how to authenticate Givenchy Antigona bags here on Spotbags that is also useful for those who are looking for great replicas of this bag. The Givenchy Antigona is already considered an iconic bag, so just like in the case of the ever-popular Givenchy Pandorareplica, people can’t get enough of it! Which is why there are so many replica versions of the Antigona bag that vary from really cheap (both in price and in appearance) to expensive high-end replicas. The Givenchy Antigona replica in this review is definitely one of the cheap ones. As far as I know the bag was bought from Ioffer but I don’t know any details about the seller. Anyway, I know you always say we should check other customer reviews and I just wanted to tell people to be more careful. This replica Givenchy faux leather bag has plenty of flaws. If I were to write a new piece on “How to authenticate Givenchy Antigona”, I would probably use these photos and say “Just make sure it doesn’t look like this at all”. Yup, it’s that bad. My problem with this Givenchy faux leather bag is not just the material it’s made of, really. A replica bag made of imitation leather can still look good. The most obvious giveaways are the triangle pad, the metal logo, the hardware engravings, the base pads, the interior tag and the size of the handles. So basically the entire bag is an obvious fake. My conclusion? While when it comes to authentic bags the price is not necessarily a quality standard, when it comes to replica bags it definitely is. I’m sure the Givenchy Antigona Medium will remain one of the most popular designer bags this year too, so let me know if you need any more advice on how to authenticate Givenchy Antigona bags! Also, I just realized there’s not a single review of a Givenchy Pandora replica on the blog, which is super weird because I know how sought-after this bag is. So is any of you girls willing to send me a review of this Givenchy bag? When people think of Louis Vuitton bags, they usually think of either the brand's ubiquitous brown and beige monogram, or maybe one of its equally iconic Damier check prints. As with most things, though, the real treasures lie just below the surface, and I'm not talking about all of the smooth leather bags Nicolas Ghesquiere has introduced in his tenure at Vuitton. No, instead, I'm here to heap a little but of much-deserved admiration on Louis Vuitton's Epi Leather. Epi Leather was introduced in 1985 as the brand's first permanent leather line, and it's been beloved for its durability and vivid color selection ever since. The leather is dyed, printed with Epi's famous three-dimensional wave pattern and then painted with a color-matching top coating, which ensures the colors are especially bright and makes the leather very resistant to water and wear. There's a reason Epi bags are so popular on the resale market: they require very little care to look virtually new for years. Perhaps best of all, Epi is a little more subtle than the materials normally associated with LV. You still get the brand's incredible craftsmanship and design, but in a slightly more discreet package and without the astronomical prices of Vuitton's more fragile and expensive smooth leathers. For us, that's a win-win. Check out some of our current favorite Epi Leather bags and accessories below.